Do you have a special gift for Mother’s Day? 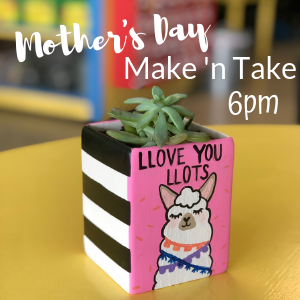 Join us to create a hand-painted planter that your special lady will cherish for years to come. We will also be planting succulents in the planters to make the perfect gift. Projects will all be ready to take home the day of the event, so you will be all ready for Mother’s Day on Sunday. A limited number of projects are available at each uPaint location. Make your reservation today!